Who wouldn't have wanted to be us last spring during the ten very special days we spent in Paris and Provence, dining out on French culture and absorbing the sights and sounds of this marvelous place? Fellow Wimco agents Anne-Marie Caye and Barbara Pierce and I traveled to France in early May to view a selection of hotels and villas in Provence, and to find out for ourselves just what it means to become an intimate part of daily life in what many consider the most alluring region of the country. Springtime is magic in Provence—before the heat of summer and the press of vacation seekers—and no one understands this better than the French themselves who open their arms to visitors and celebrate with them the sense of renewal brought on by a buoyant change in season. Despite a bit of chill to the air and impending rain upon our arrival in Paris, our mood was up and it would continue to soar on the wings of the Mistral as we made our way by train to Avignon and then by car to a number of small Provençal towns and villages including Fontvielle, Isle-sur-la-Sorgue, St. Rémy, Maussane, Paradou, Lacoste, Menerbes, Bonnieux, and Aix-en-Provence. Our adventure began in Paris. We flew to the city and witnessed a sunrise from the window of the plane on our descent. I've always had a hidden desire to live in Paris for a long stretch, say a year or even more, but 24 hours would have to do this time around and without a doubt we packed a lot into our brief stay. Long walks along la Rive gauche—particularly in the St-Germain-des-Prés area—and a whirlwind tour of assorted hotels kept us happily on the go. 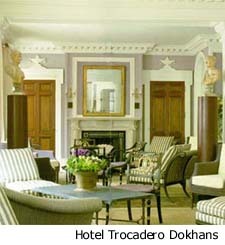 If I had to single out one hotel in Paris that truly inspires me it would be Trocadero Dokhans, located amid a quiet neighborhood in the 16th Arrondissement between l'Arc de Triomphe and la Place de Tracadéro with a stunning view of la Tour Eiffel. It is a charming hotel, small and intimate, run to all intents and purposes like a private home. Hotel Montalembert in St-Germain-des-Pr&ecute;s is managed impeccably, features a wonderful bar, and provides some of the best hotel robes, slippers and linens to be found in Paris—believe me, we road-tested them all. Hotel Bel-Ami, also in St-Germain-des-Prés, is known for its chic, cutting-edge, minimalist décor and includes a spa with workout equipment and a great breakfast buffet—definitely a hip place. And Hotel Le Senat in the heart of St-Germain-des-Prés includes an assortment of suites and rooms beautifully furnished. Alas, so much for Paris. Too soon it was off to Provence in the southeast corner of France by way of the high-speed TGV—the celebrated Train de Grand Vitesse. What a wonderful way to watch emblazoned poppy fields and brilliant expanses of wild mustard fly by in a flash, along with valleys dotted with grazing cows and hillsides blanketed with sheep! The TGV is among the more seamless ways to see the French countryside—it’s like Villa Fontvielle watching a movie, frame by frame! We traveled in first class perched around a private table with sandwiches and a bottle of wine, and within three hours we arrived in Avignon, the perfect entry to Provence. We jumped into a rented Peugeot and made quick work of the half-hour drive from Avignon to Fontvielle, our home base for the next week or so. 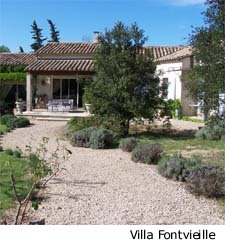 We stayed in Villa Fontvielle (CEN FTV), a lovely four-bedroom residence within walking distance of a local grocery store—le marché—and minutes outside of Fontvielle proper. 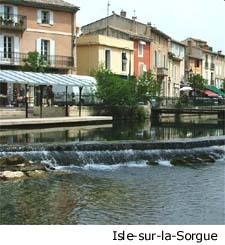 Fifteen minutes by car gets you to Maussane, 30 minutes to St-Rémy. Fontvieille is a delightful, typically friendly French village in les Alpilles just to the north of Arles and we were very comfortable here. We had our first dinner in a restaurant called la Cuisine au Planet and it turned out to be the first of more than a few dinners we enjoyed at this lovely spot. How can I describe it? You go back into the kitchen to hug the chef before you leave. The food is fresh and cooked to perfection. One party we met had been there for three nights in a row. It is intimate and special, yet genuine, unforced. 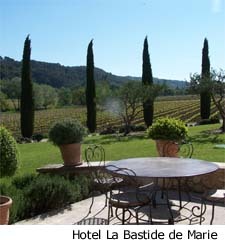 It represents the essence of rural Provençal dining. 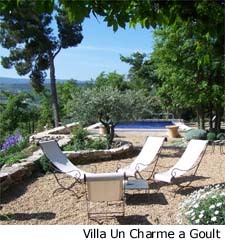 To be sure, the region in Provence identified as les Alpilles is all about this level of intimacy. We ate at local restaurants and bistros, but we also cooked in, at home, which gave us the opportunity to become virtual residents and to experience what it is like to be a part of the community—to stock up on fresh produce, to know the butcher, to see what is growing from the ground and how affectionately the Provençal French purvey it. We could walk into town from our villa in Fontvielle to open-air marchés and find everything we'd possibly want—from irises, roses and lilac in bloom, to fresh strawberries, asperges, haricots verts, and lettuce unlike any in the States, to local wines and particularly the rosé we found ourselves quite attached to during our stay.